Japanese Sunflower (Tithonia diversifolia) makes a strong floral display across the Blackall Range in autumn each year and is admired by many tourists to the area. It is a robust perennial plant forming shrubby bushes to 3 m tall, has leaves with 3 or 5 pointed lobes and scalloped margins and large yellow daisy-like flower heads about 10 cm across. However, it is a native to eastern Mexico and Central America and, despite its common name, it is not a native to Japan. 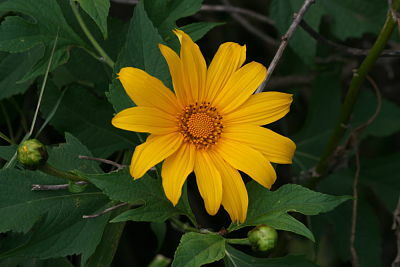 Other common names include Giant Mexican Sunflower and Tree Marigold. In the wild it is harvested for local use as a medicine and fuel. It is also sometimes grown as a companion plant helping to improve the soil and increasing the yield of a range of crops. 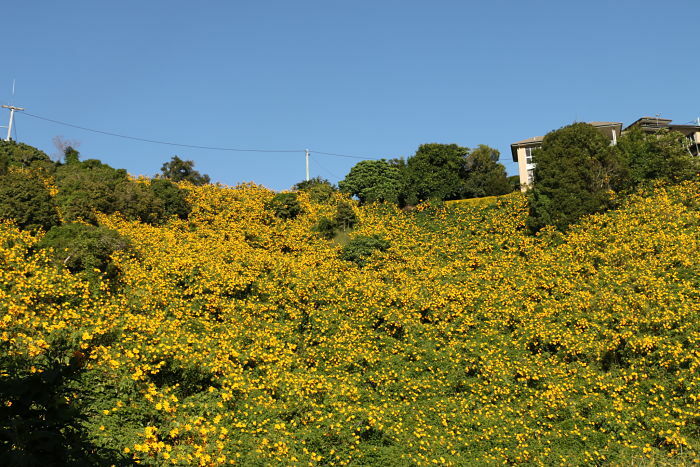 Japanese Sunflower is now naturalised in coastal districts of Qld & northern NSW. Although it is not declared or considered noxious by any State Government authorities it is regarded as a serious environmental weed, forming dense thickets and out-competing native vegetation. It is widespread and common on roadsides, embankments, unmanaged lands and degraded hillsides. Reproduction is by seed which may be dispersed by animals, water and clothing. They may also be spread in dumped garden waste.